For the Australian track and field athlete, see Andrew McCabe (sprinter). 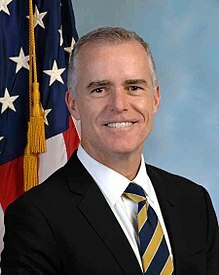 Andrew George McCabe (born March 18, 1968) is an American former Federal Bureau of Investigation (FBI) agent and attorney who served as the Deputy Director of the FBI from February 2016 to January 2018. From May 9, 2017, to August 2, 2017, McCabe served as the Acting Director of the FBI following James Comey's dismissal by President Donald Trump. U.S. Attorney General Jeff Sessions stated that McCabe was one of several candidates under consideration for Director. President Trump ultimately chose Christopher A. Wray, the former Assistant Attorney General for the Justice Department's Criminal Division, to succeed Comey. Once Wray was sworn in, McCabe returned to the position of Deputy Director. Sessions fired McCabe on March 16, 2018, 26 hours before his scheduled retirement. Sessions announced that he based his decision on reports from the DOJ Inspector General and the FBI's disciplinary office saying that McCabe had made unauthorized releases of information to the media and had misled agents who questioned him about it. McCabe disputed these charges and alleged that his firing was politically motivated. McCabe was born in 1968. He graduated from The Bolles School in Jacksonville, Florida, in 1986. He graduated from Duke University in 1990 and obtained a J.D. degree from Washington University in St. Louis in 1993. He was also a brother of the Sigma Alpha Epsilon fraternity. During law school he interned in the criminal division of the United States Department of Justice. Because of a hiring freeze, McCabe spent three years in a private law practice in Philadelphia before joining the FBI in 1996. McCabe began his FBI career in the New York Field Office in 1996. While there, he was on the SWAT team. In 2003, he began work as a supervisory special agent at the Eurasian Organized Crime Task Force. Later, McCabe held management positions in the FBI Counterterrorism Division, the FBI National Security Branch and the FBI's Washington Field Office. In 2009, he served as the first director of the High-Value Detainee Interrogation Group, a program to research interrogation techniques that was created after the Department of Defense Directive 2310 ban of waterboarding and other interrogation techniques. McCabe was part of the investigation of the 2013 Boston Marathon bombing. McCabe secured the arrest of Ahmed Abu Khattala for suspected involvement in the 2012 Benghazi attack. FBI Director Comey appointed McCabe as Deputy Director of the FBI on January 29, 2016, and he assumed those duties on February 1, 2016. In 2017 the Inspector General of the Department of Justice and the U.S. Senate Judiciary Committee investigated McCabe over concerns that he should have recused himself from the investigation of Hillary Clinton's use of a private email server because of a potential conflict of interest caused by donations to his wife's campaign as a Democrat for the Virginia State Senate. FBI documents released in January 2018 showed that McCabe had in 2015, before his wife ran for political office in Virginia, notified the FBI about his wife's plans and consulted with the FBI about how he would avoid a conflict of interest. The documents showed that McCabe followed FBI protocol regarding potential conflicts of interest. McCabe did not oversee the Clinton email server probe while his wife was running for office and he was excluded from FBI investigations into public corruption cases in Virginia. According to USA Today, "the internal documents, published on the FBI's website, support what the bureau has asserted previously: that McCabe had no conflicts when he assumed oversight of the Clinton investigation. His role began in February 2016, following his appointment as deputy director and three months after his wife, Jill McCabe, lost her bid for a state Senate seat." On May 9, 2017, McCabe became acting director of the FBI after Trump dismissed Comey as director. In the absence of a Senate-confirmed director, the deputy director automatically becomes acting director. Statute allows the president to choose an interim FBI director (acting director) outside of the standard order of succession. That process began on May 10, 2017, as Attorney General Jeff Sessions and Deputy Attorney General Rod Rosenstein interviewed four candidates to serve as interim FBI director. Sessions said that McCabe was "also under consideration." Shortly after Trump fired Comey, McCabe visited the White House for an introductory meeting in the Oval Office with the president, during which time the president reportedly asked McCabe who he had voted for in the 2016 election. The Wall Street Journal published on October 20, 2016, an account of Justice Department and FBI internal deliberations regarding an investigation of the Clinton Foundation that began in 2015. Four FBI field offices — New York, Los Angeles, Washington and Little Rock — were pursuing the investigation, with some field agents advocating that it be aggressively continued, while some supervisors and prosecutors believed there was insufficient evidence and that the investigation was too expansive. In July 2016, McCabe decided that the New York FBI office would continue investigating, with assistance from Little Rock. The Journal reported that a senior Justice Department official called McCabe to express his disagreement with this decision, with McCabe reportedly asking, "Are you telling me that I need to shut down a validly predicated investigation?," to which the unnamed official replied, "Of course not." McCabe stated in a February 2019 interview with 60 Minutes that during the days after Comey was fired, concerns about whether Trump had obstructed justice and "had been working on behalf of Russia against American interests" caused "the highest levels of American law enforcement [to try] to figure out what to do with the president," including the possibility of advocating Vice Presidential and Cabinet use of the 25th Amendment to have Trump suspended from office, and ultimately removed by Congress. Deputy attorney general Rod Rosenstein, who had previously been reported but denied having discussed such matters with his colleagues, denied McCabe's assertion as "inaccurate and factually incorrect.” McCabe's revelation prompted Senate Judiciary Chairman, Chuck Grassley, to promise investigation of the claims. Starting in July 2017, Trump repeatedly attacked McCabe in Twitter comments, suggesting that Sessions should dismiss McCabe, accusing him of conflicts because of his wife's campaign for state office, and taunting him about "racing the clock" until his retirement. In January 2018 it was reported that Attorney General Sessions had been pressuring FBI Director Wray to fire McCabe. However, Wray refused and reportedly threatened to resign if McCabe was removed. The Nunes memo, which alleges improper activities in seeking a warrant to surveil former Trump associate Carter Page, asserts that McCabe "testified before the [House Intelligence] Committee in December 2017 that no surveillance warrant would have been sought from the FISC without the Steele dossier," a document many Trump supporters insist is completely false. However, McCabe's testimony was in classified session and no public transcript is available to confirm the Nunes memo assertion; disclosing contents of the classified testimony would be unlawful. Democratic Representative Eric Swalwell, a member of the House Intelligence Committee, said the Nunes memo "seriously mischaracterizes the testimony of Deputy Director Andrew McCabe." The Nunes memo also asserts that a text message from Peter Strzok discusses "a meeting with Deputy Director McCabe to discuss an "insurance" policy against President Trump's election." However, The Wall Street Journal reported on December 18, 2017, that Strzok associates said the "insurance policy" meant the FBI continuing its investigation into possible collusion between Trump and Russians, in case Trump won the election. After meeting with Director Wray concerning the OIG report and a possible demotion, McCabe announced on January 29, 2018, that he was stepping down as deputy director, effective immediately. He then went on paid leave until his scheduled retirement date of March 18, 2018, his 50th birthday, at which point he would be eligible for a retirement pension. McCabe did not lose his entire pension. On March 1, 2018, the New York Times and Washington Post, citing persons familiar with an investigation by Michael E. Horowitz, the Justice Department inspector general, reported that the inspector general was preparing a report that would conclude that McCabe was "responsible for approving an improper media disclosure," specifically relating to an October 2016 Wall Street Journal article that reported on disagreements between the FBI and Justice Department over an investigation of the Clinton Foundation. On March 14, 2018, the FBI's Office of Professional Responsibility, citing the inspector general's conclusions, recommended that McCabe be fired. Attorney General Sessions announced at 10 p.m. on Friday, March 16, 2018, that he was taking the recommendation and firing McCabe. He cited the inspector general's report, which had not yet been publicly released, saying that "Mr. McCabe had made an unauthorized disclosure to the news media and lacked candor - including under oath - on multiple occasions." McCabe told The New York Times, "The idea that I was dishonest is just wrong. This is part of an effort to discredit me as a witness." McCabe was dismissed less than two days before he would have collected a full early pension for his FBI career. He may have to wait until age 57–62 to begin collecting pension benefits. Trump immediately celebrated on Twitter, saying "Andrew McCabe FIRED, a great day for the hard working men and women of the FBI - A great day for Democracy." On March 17, Democratic Congressman Mark Pocan of Wisconsin offered McCabe a security post in his congressional office. With McCabe short by two days of work for a federal agency to receive his benefits, Pocan said that "Andrew McCabe's firing makes it clear that President Trump is doing everything he can to discredit the FBI and undermine the Special Counsel's investigation" and described his job offer as a "legitimate offer to work on election security". Massachusetts Democratic Congressman Seth Moulton was also reported to be considering offering McCabe a position in his office. On March 21, 2018, FBI Director Christopher Wray stated that McCabe's firing was not politically influenced but done "by the book." Also on March 21, immediately after McCabe's firing, a parallel situation was noted and reported: that just as Jeff Sessions had fired McCabe for lacking "candor", McCabe had, nearly a year previous to his own firing, authorized a criminal investigation into "whether Sessions lacked candor when testifying before Congress about contacts with Russian operatives". On April 13, the OIG report was released to Congress and obtained by the Associated Press, which then published it. McCabe issued a response to the report, disputing its conclusions. The report found that McCabe lied to or misled federal investigators at least four times, with three of these instances occurring while he was under oath. The report also stated that his approval of disclosures to the media was within his power, but was a policy violation because it was done "in a manner designed to advance his personal interests at the expense of Department leadership." McCabe's lawyer Michael R. Bromwich responded that the investigation and report had been politicized by pressure from Trump, and announced that McCabe intended to sue the Trump administration and senior officials for "wrongful termination, defamation, Constitutional violations and more". On April 19, 2018, it was reported that the Inspector General referred its findings from the report to the United States Attorney's Office in Washington D.C. for possible criminal charges associated with lying to FBI investigators. In a February 2019 interview with Scott Pelley of "60 Minutes" McCabe said he took actions to protect the Russian-interference investigation from successors who might terminate it, because he or Mueller could be removed from their positions. He said "I wanted to make sure that our case was on solid ground and if somebody came in behind me and closed it and tried to walk away from it, they would not be able to do that without creating a record of why they made that decision." He ordered the probe of possible obstruction of justice by President Trump. McCabe is married to Jill McCabe, a pediatrician, who was a Democratic candidate for the Virginia state senate in 2015. They have two children, a son and a daughter. He is a triathlete who biked 35 miles (56 km) to work from his home in Virginia. ^ Levine, Mike (March 16, 2018). "In his own words: McCabe claims firing part of 'ongoing assault' on Russia probe". ABC News. Retrieved March 17, 2018. ^ Apuzzo, Matt; Goldman, Adam (March 1, 2018). "Andrew McCabe, Ex-Deputy Director of F.B.I., Will Be Faulted for Leaks". The New York Times. Retrieved March 2, 2018. ^ Nobles, Ryan. "McCabe did not vote in 2016 general election, but did vote in 2016 GOP presidential primary". Retrieved March 2, 2018. ^ Pappas, Alex (March 15, 2018). "IG could soon release explosive report on FBI's Clinton probe, as Sessions weighs firing McCabe". Fox News. Retrieved March 16, 2018. ^ Thrush, Glenn; Davis, Julie Hirschfeld (June 7, 2017). "Trump Picks Christopher Wray to Be F.B.I. Director". The New York Times. ISSN 0362-4331. Retrieved June 7, 2017. ^ Max Kutner. Under New Bureau Head, Acting FBI Director Andrew McCabe to Remain as Deputy, Despite Trump’s Allegations. Newsweek. August 2, 2017. ^ Zapotosky, Matt. "FBI's Andrew McCabe is fired a little more than 24 hours before he could retire". The Washington Post. The Washington Post. Retrieved March 17, 2018. ^ "Andrew McCabe, the former FBI deputy director targeted by Trump, was just fired". Vox. Retrieved March 17, 2018. ^ Bo Williams, Katie (March 16, 2018). "Sessions fires McCabe from FBI". The Hill. Retrieved March 17, 2018. ^ Tanfani, Joseph (March 16, 2018). "Former FBI official Andrew McCabe, a target of Trump, is fired just before his retirement". latimes.com. Los Angeles Times. Retrieved March 17, 2018. ^ Singman, Brooke; Gibson, Jake (March 17, 2018). "Former FBI Deputy Director Andrew McCabe fired". Fox News. Retrieved March 17, 2018. ^ Goldman, Adam; Haag, Matthew (February 14, 2019). "McCabe Says Justice Officials Discussed Recruiting Cabinet Members to Push Trump Out of Office". The New York Times. Retrieved February 14, 2019. ^ "McCabe '86 Named Acting FBI Director". The Bolles School. Archived from the original on May 5, 2017. Retrieved May 13, 2017. ^ "The School of Law" (PDF). One Hundred and Thirty-Second Commencement. Washington University in St. Louis. 1993. p. 35. ^ a b c d Wilber, Del Quentin (May 5, 2016). "FBI's new second-in-command makes decisions, not headlines". Los Angeles Times. Retrieved October 31, 2016. ^ SAE Alumni Directory. Evanston, IL. 2018. ^ a b c "Andrew McCabe". CNBC. September 26, 2016. Retrieved May 10, 2017. ^ Trimble, Megan (May 12, 2017). "10 Things You Didn't Know About Andrew McCabe". U.S. News & World Report. Washington, D.C.: U.S. News & World Report, L.P. Retrieved January 29, 2018. ^ Gurman, Sadie; Tucker, Eric; Miller, Zeke; Colvin, Jill (January 29, 2018). "FBI's McCabe, a frequent Trump target, abruptly leaves post". The Seattle Times. Seattle: The Seattle Times Company. The Associated Press. Retrieved January 29, 2018. ^ a b c d Adam Goldman; Matt Apuzzo (May 12, 2017). "Andrew McCabe Is Known at F.B.I. for His Precision and Intellect". The New York Times. p. A18. Retrieved May 14, 2017. ^ Clemens, Jay (July 31, 2015). "Andrew McCabe Named FBI Associate Deputy Director". ExecutiveGov. Executive Mosaic. Archived from the original on August 12, 2015. ^ a b Williams, Janice (May 9, 2017). "Who Will Be the New FBI Director Now That James Comey Has Been Fired?". Newsweek. Retrieved May 10, 2017. ^ Wilkers, Ross (October 24, 2013). "Andrew McCabe Appointed FBI Natl Security Branch Lead". ExecutiveGov. Executive Mosaic. Archived from the original on November 21, 2013. ^ "Andrew G. McCabe Named Deputy Director of the FBI" (Press release). Federal Bureau of Investigation. January 29, 2016. Retrieved October 31, 2016. ^ Kutner, Max (May 10, 2017). "FBI Acting Director Andrew McCabe is also under review for the Clinton email investigation". Newsweek. Retrieved May 12, 2017. ^ a b c "FBI documents: Andrew McCabe had no conflict in Hillary Clinton email probe". USA TODAY. Retrieved January 5, 2018. ^ "Emails released by the FBI shed new light on deputy director's recusal from Clinton probe". Business Insider. Retrieved January 9, 2018. ^ Strohm, Chris; Talev, Margaret; Dennis, Steven T. (May 9, 2017). "Trump Fires FBI Director James Comey Amid Russia Meddling Probe". Bloomberg L.P. Retrieved May 10, 2017. ^ "Designation of Officers of the Federal Bureau of Investigation". Federal Register. February 14, 2007. pp. 7341–7344. Retrieved May 11, 2017. ^ a b Keith, Tamara (May 10, 2017). "Despite Recusal Pledge, Sessions Interviewing Candidates For Interim FBI Director". NPR. Retrieved May 11, 2017. ^ Tatum, Sophie (January 23, 2018). "Washington Post: Trump asked acting FBI director McCabe who he voted for in 2016". CNN. Retrieved January 23, 2018. President Donald Trump asked acting FBI director Andrew McCabe who he voted for in the 2016 election in an introductory Oval Office meeting, The Washington Post reported Tuesday, citing several current and former US officials. The meeting happened in May, not long after Trump fired former FBI director James Comey, according to the Post. ^ Barrett, Devlin (October 30, 2016). "FBI in Internal Feud Over Hillary Clinton Probe". Retrieved March 17, 2018 – via www.wsj.com. ^ Goldman, Adam; Haag, Matthew (February 14, 2019). "McCabe Says Justice Officials Discussed Recruiting Cabinet Members to Push Trump Out of Office" – via NYTimes.com. ^ BBC.com (February 18, 2019). "Trump lashes out at 'treasonous' officials". Retrieved February 18, 2019. ^ a b Williams, Katie Bo (March 16, 2018). "Sessions fires McCabe from FBI". The Hill. Retrieved March 18, 2018. ^ a b Price, Greg (January 29, 2018). "All the times Trump attacked Andrew McCabe before deputy FBI director stepped down". Newsweek. Retrieved March 18, 2018. ^ Swan, Jonathon (January 23, 2018). "Scoop: FBI director threatened to resign amid Trump, Sessions pressure". Axios. Retrieved January 29, 2018. ^ Barrett, Devlin; Rucker, Philip (January 29, 2018). "FBI Director Wray resists pressure from Sessions to replace senior personnel as tensions swell". Chicago Tribune. Retrieved January 29, 2018. ^ Blake, Aaron (February 3, 2018). "Analysis - 4 crucial questions about the Nunes memo". Retrieved March 17, 2018 – via www.washingtonpost.com. ^ "Read: the full text of the Nunes memo". Retrieved March 17, 2018. ^ Wilber, Del Quentin (December 18, 2017). "In FBI Agent's Account, 'Insurance Policy' Text Referred to Russia Probe". Retrieved March 17, 2018 – via www.wsj.com. ^ "FBI Deputy Director Andrew McCabe steps down abruptly". CNN. January 30, 2018. Retrieved March 18, 2018. ^ "FBI Deputy Director Andrew McCabe stepping down". January 29, 2018. Retrieved January 29, 2018. ^ Bauer, Elizabeth (March 17, 2018). "No, Andrew McCabe Isn't 'Losing His Pension'". Forbes. Archived from the original on April 1, 2018. Retrieved April 1, 2018. ^ Kalmbacher, Colin (March 19, 2018). "Turns Out Andrew McCabe Didn't Lose His Pension After All". Law & Crime. LawNewz, Inc. Archived from the original on April 1, 2018. Retrieved April 1, 2018. ^ Jarrett, David Shortell and Laura. "McCabe could lose 'a lot of money' if fired before Sunday". CNN. Archived from the original on April 1, 2018. Retrieved April 1, 2018. ^ Apuzzo, Matt (March 1, 2018). "Andrew McCabe, Ex-Deputy Director of F.B.I., Will Be Faulted for Leaks". The New York Times. ^ Zapotosky, Matt; Demirjian, Karoun (March 1, 2018). "Report said to fault FBI's former No. 2 for approving improper media disclosure, misleading inspector general". The Washington Post. ^ Mathis-Lilley, Ben. "FBI May Fire Andrew McCabe After Review Finds He Wasn't "Forthcoming" About Clinton Investigation". Retrieved March 17, 2018. ^ Brown, Pamela (March 15, 2018). "Andrew McCabe pleading case at Justice Department". CNN. Retrieved March 16, 2018. ^ Williams, Pete (March 16, 2018). "Sessions fires McCabe before he can retire". NBC News. Retrieved March 17, 2018. ^ Apuzzo, Matt; Goldman, Adam (March 16, 2018). "Andrew McCabe, a Target of Trump's F.B.I. Scorn, Is Fired Over Candor Questions". Retrieved March 17, 2018 – via NYTimes.com. ^ Jarrett, Laura; Shortell, David (March 16, 2018). "Embattled FBI official Andrew McCabe could lose 'a lot of money' if fired before Sunday". CNN. Retrieved March 17, 2018. ^ Stewart, Emily (March 17, 2018). "Trump says Andrew McCabe's firing is a "great day for democracy"". Vox. Retrieved March 17, 2018. ^ Annysa Johnson. "Wisconsin Democrat U.S. Rep. Mark Pocan offers fired FBI deputy director McCabe a job". Milwaukee Journal Sentinel. Retrieved March 18, 2018. ^ Samuels, Brett (March 21, 2018). "Wray: McCabe firing was not politically influenced". The Hill. Retrieved March 23, 2018. ^ Adam, Edelman (March 21, 2018). "FBI chief on McCabe firing: Politics and the FBI don't mix". NBC News. Retrieved March 23, 2018. ^ Levine, Mike (March 21, 2018). "Fired FBI official authorized criminal probe of Sessions, sources say: Exclusive". ABC News. Retrieved March 23, 2018. ^ Tucker, Eric; Jalonick, Mary Clare. "Ex-FBI deputy director McCabe misled investigators: watchdog report". Chicago Sun-Times. AP. ^ a b Zapotosky, Matt (April 13, 2018). "Inspector general report faults Andrew McCabe for unauthorized disclosure of information, misleading investigators". The Washington Post. Retrieved April 13, 2018. ^ a b Shaw, Adam; Brooke, Singman (April 13, 2018). "DOJ IG releases explosive report that led to firing of ex-FBI Deputy Director Andrew McCabe". Fox News. Retrieved April 17, 2018. ^ Serwer, Adam (April 13, 2018). "Trump's Claims About McCabe Aren't Supported by Internal FBI Review". The Atlantic. Retrieved April 15, 2018. ^ Brown, Pamela; Jarrett, Laura (April 19, 2018). "Justice Dept. watchdog sends McCabe findings to federal prosecutors for possible charges". CNN. Retrieved April 19, 2018. ^ "McCabe says he ordered the obstruction of justice probe of President Trump". CBS News. February 14, 2019. Retrieved February 14, 2019. ^ "Trump slams FBI Deputy Director Andrew McCabe for donations to wife's campaign". December 23, 2017. Retrieved January 29, 2018. ^ "Trump slams FBI Deputy Director Andrew McCabe for donations to wife's campaign". May 9, 2017. Retrieved January 31, 2018. This page was last edited on 26 March 2019, at 16:47 (UTC).